Pummeled by the Atlantic and famously remote from the mainland, Scotland’s largest island shares the twin territories of Harris and Lewis – and, now, two distilleries as well. Tom Bruce-Gardyne visited both. Above the clouds, the turboprop plane from Glasgow felt stable enough. Below them, as we made our descent over the sea to Stornoway, things became more exciting. The wind roared up the runway to greet us and refused to let the propellers die even after we’d stopped. Finally some brave soul grabbed the blades and we were allowed off. If you squint at the map, maybe after a dram or two, Lewis and Harris resembles the head of a giant salmon trailing its emaciated body of islands Around the north-west coast of Scotland. These Outer Hebrides help shelter Skye and the Small Isles on one side, and face the full force of the Atlantic on the other. Beyond lies the remote outpost of St Kilda –then 2,000 miles of nothing until you hit Newfoundland. A 50-minute commute from Scotland’s Central Belt hardly does justice to those intrepid explorers who came to peer over the edge of the known world – what the ancient Greeks called Ultima Thule. Perhaps the locals had been winding him up. Subsequent visitors also mentioned the islanders’ love of the hard stuff, and the relative abundance of barley. Why they had to distil it was something James MacDonald despaired of when he visited in 1810. He urged them to copy the good folk of Islay who ‘prefer good ale to bad whiskey’. As I headed west on the road to Uig, there were no strips of barley, but plenty of peat bogs and lochs to supply fuel and water for whisky. Yet the only recorded distillery in these parts was Shoeburn in Stornoway, set up in the 1820s and closed within 30 years. Its owners did a brisk trade with visiting sailors and had plans to enter the Glasgow market, and even appoint an agent in London. Some say it fell victim to the teetotal, God-fearing wife of Sir James Matheson, who bought the isle of Lewis for £190,000 in 1844. That her husband’s fortune came from flogging opium to the Chinese was an irony that entirely escaped her. But maybe Shoeburn just couldn’t compete with all the illicit hooch, which was once ‘rife from the top of Lewis right the way down to Barra’, according to Marko Tayburn, who became the second licensed distiller in the island’s history in 2010. ‘The idea had been bouncing around my head for a long time,’ he explains, ‘and I’d always had an interest in whisky and having a dram in good company.’ His Abhainn Dearg (pronounced aveen jarrek) distillery is housed in an abandoned fish farm in Uig and stands as a monument to Hebridean moonshine. With its ramshackle assortment of pipes, vats and scaffolding, it’s certainly unique, and that’s before you spot the stills, like a pair of hot water tanks lurking at the back. Each has a neck like a witch’s hat stretched up to the ceiling and, if you notice a resemblance to the illicit still by the entrance, you’re spot-on. As Marko gleefully explains, his are just a scaled-up version to placate Her Majesty’s Excise. And the still by the entrance? ‘That was kindly donated to us. Some old illicit distiller thought it time to hang up his boots, and thought it’d make a nice feature,’ he says. ‘If you ever get me drunk, you might get a bit more out of me than that. ‘I might even be able to point you to a few lochs where I believe there might be the remnant of an old still.’ I’ll have to come back and tease out the stories with as many drams as it takes, but sadly I need to go. There’s a whisky-fuelled party down in Harris and I’m running late. Tarbert, the island capital and ferry link to Skye, sits at the head of a sea loch which was partially filled in 10 years ago to create a patch of land. The locals were told a Harris Tweed visitors centre might one day occupy the space, but nothing happened and, when news spread of a possible distillery, there was much scepticism. The story was traced to Anderson Bakewell, a reclusive tycoon who owned a house on the neighbouring island of Scarp. The Anglo-American musicologist was aware that Harris was clinging on to a fragile economy, with a population that had halved in 50 years, and wanted to do something for a place he cared about deeply. ‘If only there was some way to bottle it,’ he mused, unaware of the obvious answer. Obvious in theory, but painfully hard in practice, given the £10m needed to get a boutique, new-build distillery off the ground. The big break came a week before Christmas 2012, when managing director Simon Erlanger discovered he had won nearly one-fifth of the money in a government grant. It proved the catalyst for 18 private investors to stump up the rest. The party at Tarbert’s old police station, and now company HQ, was in full swing. As dusk came, a group of us headed over the road for a hard-hat tour of the new distillery. The white-washed, A-frame building could be a church, but for the twin stainless steel tanks outside. Inside, Erlanger explains the ethos: ‘It’s going to be a working distillery that welcomes guests. There’ll be a big peat fire in the entrance, and we’ll start our tours with a dram – unlike most distilleries where you get one at the end. Upstairs, a pair of Italian stills, as pink as new-born babies, wait to be fired into life and imbue the new distillery with its heart and soul. A coppersmith near Siena was chosen, because Forsyth’s, Scotland’s great still maker in Rothes, is pretty busy these days. We were told Harris should start distilling by the autumn. The aim is for a light-medium peated malt (15-20 parts per million), with four years’ aging in first-fill ex-Buffalo Trace Bourbon barrels, some Oloroso Sherry butts and something else. ‘It’s a secret, but it could be quite interesting,’ says Erlanger. That night I met most of the Tarbert 10, as the distillery workers are called, and learnt how it is already the town’s biggest employer. Listening to their stories as the drink flowed, the sense of pride in what’s been achieved so far, as well as the sense of anticipation for what’s to come, felt pretty infectious. Maybe it was the whisky talking, but I don’t think so. With the landed cost of barley currently £66 a tonne, compared to £6 on Speyside, The Hearach single malt is unlikely to be cheap. The aim is to produce 300,000 bottles a year, after an initial batch of just 1,916 bottles, one for every resident on Harris. Two hundred private casks are also being pre-sold and, by May 2015, only 40 were left. To age the spirit, a warehouse is being built at Ardhasaig on the island’s west coast, where the casks can soak up some of what Simon calls ‘the island’s unique, elemental climate’. It was something I had experienced for myself in just 24 hours in the Outer Hebrides. I can’t wait to return. Loganair operates a daily, direct service to Stornoway from Glasgow, Edinburgh and Inverness, on behalf of Flybe. 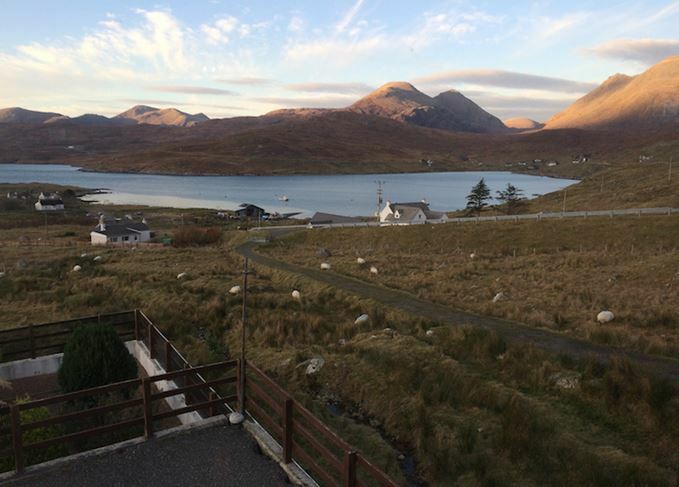 Hotels in Tarbert include the Harris Hotel and Hotel Hebrides, while half an hour away is the family-run Rodel Hotel on the southern tip of Harris. The Pierhouse restaurant (Hebrides Hotel) in Tarbert, or on South Harris The Anchorage Restaurant (Leverburgh), or the nearby Rodel Hotel. Scour menus for local shellfish – scallops, langoustine and similar from the Sound of Harris, local lamb and venison, and Stornoway black pudding. The Harris Tweed shop in Tarbert has everything from fitted tweed jackets to tea cosies, and you can see weavers in action at the Harris Tweed Co at nearby Grosebay. Golfers should head for the Isle of Harris Golf Club, while fishermen can try for salmon (late May to mid-October), or trout in the many hill lochs. There are boat trips to St Kilda from Leverburgh, or more active types can brave the Atlantic waters and take surfing lessons with Surf Lewis or Hebridean Surf. The Isle of Lewis distillery has unveiled its oldest expression to date. Whisky lovers can take in four distilleries while island-hopping Scotland’s west coast.